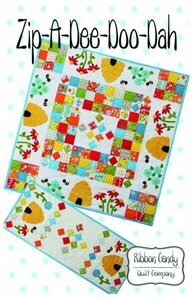 Here's a cheery table topper set for summer fun! Easy and fast to peice. The applique is done with wool, but be made with cotton instead. Templates are full size and ready to use. Table topper finishes 32" x 32". Table runner measures 12" x 30"